Quinoa can be hard to pronounce but has won the hearts of health-conscious consumers in international food markets. Supporters hope one day to say the same for the middle-eastern grain, freekeh. This ancient whole grain is made from green wheat that is then roasted. In foodie circles, it is gaining in popularity alongside millet, farro, and others. A Feed the Future initiative in Lebanon funded by the U.S. Agency for International Development has been working to develop the local freekeh industry for a year now, with promising results. After recognizing the potential for export, the team from the Lebanon Industry Value Chain Development (LIVCD) project set out to identify the constraints keeping Lebanese freekeh producers from penetrating regulated and international markets. The freekeh harvested by Lebanese farmers has traditionally been spread on the side of roads and exposed to the sun for three to six hours. The wheat is then roasted on site and exposed for another four hours to ensure that it is fully dried before dehulling. This method typically results in inconsistent roasting and excessive contamination, which makes for a relatively poor product. Working with several farmer cooperatives in southern Lebanon, LIVCD and Austin, Texas-based tech firm National Instruments designed and built a roaster and dryer, automating the process and ensuring consistent, high-quality freekeh that meets international food safety standards. The next step was to help farmers expand their freekeh varieties. Teaming with the Lebanese Agricultural Research Institute, DAI-led LIVCD introduced a new variety of wheat developed by the International Center for Agricultural Research in the Dry Areas that has a desirable large grain and high yield in arid regions. This variety is suitable for rural south Lebanon with its dry conditions and large tracts of uncultivated land. To test the new process, LIVCD worked with the woman-run Al-Imad Cooperative in the southern village of Hariss. Al-Imad Cooperative contracted with local farmers to grow the new variety of wheat, and tested it on the newly developed equipment. The result: the new variety produced double the yield of the local variety, with a considerably larger grain that is far more desirable to consumers. In addition, the new freekeh is free of contaminants and meets international standards. 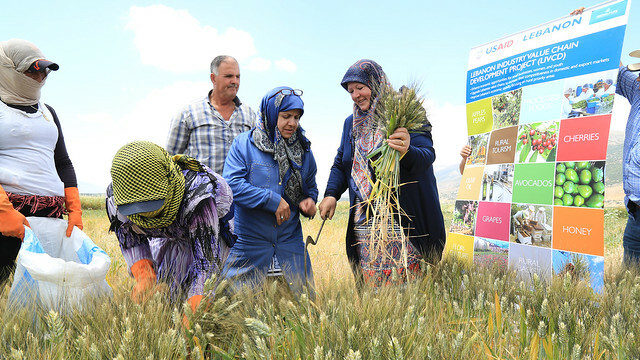 The tests showed that using the new wheat variety and the automated equipment will enable a doubling in production capacity, cutting the cost by half while allowing female-led cooperatives to control the entire freekeh production process and earn significant income. By cutting costs so dramatically, the cooperative is now able to compete with the lower-quality Syrian, Egyptian, and Turkish freekeh. Recently, LIVCD, its partners—the Al-Imad Cooperative, National Instruments, and the Rural Delights Marketing Cooperative—held a workshop to introduce the new and improved freekeh to food processors, exporters, and officials from the Ministry of Agriculture. Exporters are already making orders for the 2016 season and LIVCD will continue to support the sector as it ramps up production of freekeh. LIVCD aims to improve Lebanon’s economic stability and food security, with a focus on supporting rural areas, decreasing migration to urban centers, and providing economic opportunities for women and youth.